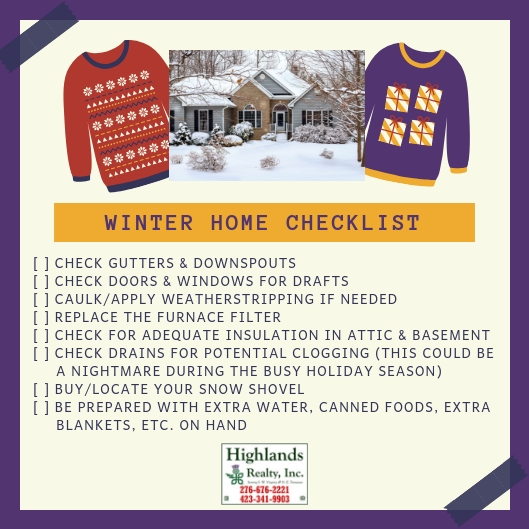 Prepare your home for winter with these tips from Highlands Realty, Inc.
During the holidays some home maintenance tasks may be forgotten…don’t let that happen to your home! Be prepared by tackling these tasks before guest begin arriving and the hustle and bustle of holidays set in. Our checklist will make it a breeze! Check gutters and downspouts. Double check that gutters are clear from debris and leaves to ensure that melting snow will drain smoothly. Clogged gutters and downspouts can cause tons of damage due to not draining away from your home’s foundation properly. Check doors & windows for drafts. When cold weather hits, you want to be sure you’re not trying to heat the outside as well! Another tip would be to change out light weight curtains in the winter for heavier ones to help add another layer to keep the cold air out. If needed, caulk or apply weatherstripping to fix any air drafts found. Doing this will also help with your heating bill as you won’t have warm air escaping in those hidden spots. Check for adequate insulation in attic and basement. Not having adequate insulation can have your heating system working overtime in cold weather. So checking insulation and adding more if needed will help keep your home warmer and save your money in heating costs. Check drains. With the holidays bringing additional house guests, it is a good idea to double check drains to ensure they are free from potential clogging. Nobody wants to be in the middle of a holiday party to find that the toilet has became clogged or the sink is not draining properly! Buy or find your snow shovel. Go ahead and pull the snow shovel out of the back of the garage and inspect that it can survive another season. If needed, go buy a snow shovel or other snow removal equipment so you are prepared before it comes. There’s nothing like rushing to the store to buy these items when a major snow storm is forecasted…what happens if you can’t find these items at the last minute due to snow storm panic? Be prepared by keeping extra water, canned foods, extra blankets, and other emergency items on hand. You never know when the weather could go from bad to worse, so it is always a good idea to have these items just in case. After finishing these home maintenance tasks, you deserve a break! Make a cup of hot cocoa, tea, or cider and enjoy a good book or your favorite TV show.